This book explains why and how beekeepers can use increase nuclei to solve problems in the beeyard and use them to winter colonies and provide a reliable source of fresh bees, locally acclimatized queens, replacement hives and colonies for operational growth or sale. Connor draws on the concepts of Langstroth, Doolittle, Brother Adam, Mike Palmer and more while integrating his unique academic and commercial beekeeping experiences into this concise and thought-provoking second edition. Adding more methods of making increase colonies and recent developments in the science of bee biology, the second edition expands on its predecessor with rich, colorful photography and diagrams. In less than a decade, the beekeeping industry has made a wide-spread shift to increase nuclei colonies as a means of producing new colonies in the face of heavy losses from poor nutrition, pesticides, virus-mite interactions and general climate change. Professional Beekeeper Ed Weiss takes you step by step through your first year of beekeeping. Watch Ed as he shows you how to introduce your bees into their new hive; look over Ed's shoulder as he finds eggs, larvae, pollen and honey in the honeycomb cells. Learn how to capture a swarm of bees. And many, many more informative steps that take you through your first season of beekeeping. Taylor is part husbandman, part naturalist, part philosopher, mainly putterer. This is the cozy tale of his seasonal activities among his hives, from the swarming in the spring to the fall honey flow and later spinning in his workshop sanctuary, away from the perils and irritations of real life -- like his university president who once dropped in to ask Taylor to go sailing, of all frivolous, foolish things, and indirectly caused a terrible muck-up of beeswax in the steam boiler system. . . . He admires his much maligned insects because unlike, say, those dumb domesticated horses or chickens, bees remain untamed and uncorrupted by man. They represent the eternal mystery and assurance Nature offers: "I gaze in unuttered reverence, and I am fulfilled."" Congenial, old-fashioned countrified wisdom -- a simple pleasure. The book begins with an introduction to the honeybee and its life-cycle, so that newcomers to the hobby will readily understand the nature of their charges. Useful advice is given on how to obtain bees and equipment, and management techniques, such as handling a colony and coping with the honey harvest, are discussed in detail. 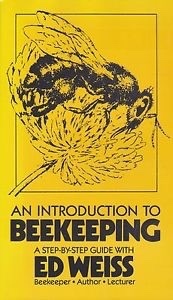 There are also sections on bee diseases and enemies, and hygiene in the hive and apiary. One of Europe's most successful natural beekeepers shares an approach that is fun, healthful, rewarding, and accessible to all. In this richly illustrated volume, he provides instruction in making bee-friendly, well-insulated horizontal hives. Beekeeping is making a comeback in neighbourhoods everywhere, embraced and lauded as a source for sustainable, nutritious food and a contributing factor in maintaining a healthy population of pollinators for our food sources. As a hobby, beekeeping is relatively inexpensive. Ashley English guides readers through key issues to consider before taking on beekeeping, including space considerations, time commitment, local ordinances and more. Get the lowdown on hive anatomy and find out what kind of hive(s) to acquire to suit your needs. Everything you need to know about acquiring, housing, maintaining and caring for your bees year-round is included with all the basics and invaluable time-tested advice. Learn the science of honey and get the basics on harvesting and packaging it. Each chapter features a profile of real people keeping bees for various reasons in different settings. Get 10 tested honey-centric recipes that run from breakfast through dinner, all captured in beautiful, mouth-watering photographs. Helpful reference charts on monthly/annual care, many beautiful photos and so much more make this the helpful, I'm-right-there-with-you book on the subject. The author's first book. The Barefoot Beekeeper, set out a challenge to the world of conventional beekeeping and offered an alternative paradigm. It soon became apparent that other people had been thinking along similar lines, and when bees were headlined month after month in the national press, following the outbreak of so-called “colony collapse disorder” in the USA, many more people became interested in bees and what became known as the 'natural beekeeping' movement began to emerge. Learning From Bees is a collection of short essays on bees and beekeeping, many of which are published here for the first time. Turn your honey into wine. This DVD shows you how, takes you through the whole process step by step. 60 min. The bibliography is a great reference list on the topic. Along with 200 year old recipes...very informative. From the front cover: The British Bee-Keepers Association; Instituted May, 1874. For the Encouragement, Improvement, and Advancement of Bee Culture in the United Kingdom, particularly as a means of bettering the Condition of Cottagers and Agricultural Labouring Classes, as well as the advocacy of humanity to the industrious Labourer— the Honey Bee. The National Strategy to Promote the Health of Honey Bees and Other Pollinators was developed through a collaborative effort across the Executive Branch. This Strategy outlines a comprehensive approach to tackling and reducing the impact of multiple stressors on pollinator health, including pests and pathogens, reduced habitat, lack of nutritional resources, and exposure to pesticides. Keeping bees in a more natural way is growing in popularity throughout the world. Older hive designs are being reappraised, and methods that have been used for over a century are being questioned. The People's Hive of Abbé Émile Warré (1867-1951) is one of the older designs that beekeepers find particularly attractive. Several commercial honey producers have already adapted it to fir their needs. Warré one-size box with top-bars, natural comb and insulting quilt, create ideal conditions for colony vitality and survival, as well as reducing consumption of honey stores in winter. The hive is now used worldwide in climates ranging from the tropics to the taiga. A valuable reference for beekeepers, gardeners, naturalists, and anyone who is interested in the nectar and pollen producing flora of the Pacific Northwest. Hummingbirds, butterflies, bumblebees and other insects may also be attracted to, and benefit from, many of the plants described in this book.